Implementing an ERP from scratch takes a considerable time and effort. Selecting the best fit ERP will actually maximize the ROI, but this is only one side of the story. ERP Implementations have to be well planned, especially if you consider the traditional procedural models, lengthy integration and user acceptance testing are done only at the end adding to increase costs due to changes and errors. Implementing ERP in organizations are not considered to be easy due to various factors like availability of key stakeholders, alignment of consultants, changing business processes adding to the woes of consultants. Finally, after looking at the different challenges each time faced by the team, a concept emerged where the customer, the IT teams and the consultants all can come together to understand the business needs together. As this experiment worked a concept was developed as Agile-ERP. Agile actually has been originated from the software but a few of its parts can be used in the ERP. Agile is that concept where you can continuously design, test and implement the smaller parts of the system and then move on to the next system. You design, build, test and seek feedback from customers early on and maximize the success. An alternative to this is the ‘Big Bang ERP’ implementation. They are very dangerous and tend to destroy the things. But at times the big bang approach is sensible for switching from an old to new system. The key for agile is to keep everyone involved and in constant communication. Communication is the key in an agile environment. Before starting the agile process the companies should spend some time on the documentation. A brainstorming should be done with all the teams that are required for the process. Scrum in an Agile framework for completing complex projects. Whenever an agile implementation process starts the requirement gathering starts with the Scrum meetings. The users show the consultants how their current system works. The consultants then show how those transactions would work in the ERP system and show them the difference. If the users are not satisfied they talk to the consultants about the problem and the feedback in incorporated. The documentation of Agile is not very formal. The consultants may use requirement management software called as ‘Jira’ which is used for capturing use cases or user stories. The users and the consultants together configure the system to resolve each of the use case. The final step would be to take the confirmation from the users. This approach actually works very fast and is done in a short span of sprint. One of the most important thing is that every second week the consultants are meeting the users with the latest updates. These updates are tested in the sandbox and if there are any problems they will be fixed immediately. The scrum meetings are mostly successful as the users greatly accelerate the development of the requirement as compared to the traditional methods. The development cycles are generally short as there is configuration. Take an example where in a span of two week sprints the problems are caught very easily and customer feedback is incorporated. An agile like ERP implementation if used can greatly reduce the risk of an enterprise software implementation project not being on time and on budget. It is even true if the circumstances demand a big bang goes live. 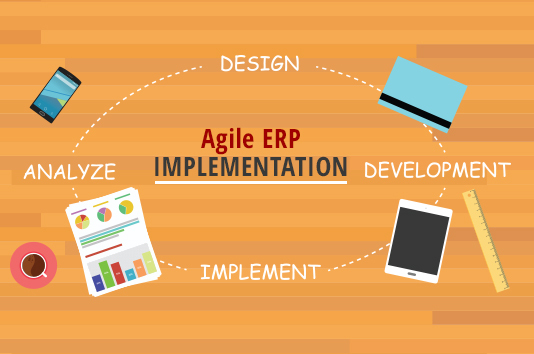 Do you think that an Agile ERP should be implemented in your organization? Then take Inspirria Cloudtech as your premier Cloud Service Provider with decade plus of experience working with 500+ Cloud projects. Push productivity to its optimum level with proven solutions, which is used by the best companies all over the world.